The War of the First Coalition broke out in autumn 1792, when several European powers formed an alliance against Republican France. The first major operation was the annexation of Nice (part of the Duchy of Savoy) by 30,000 French troops. This was reversed in mid-1793, when the Republican forces were withdrawn to deal with a revolt in Lyon, triggering a counter-invasion of Savoy by the Kingdom of Piedmont-Sardinia (a member of the First Coalition). After the revolt in Lyon had been suppressed, the French under General Kellermann managed to push back the Piedmontese with just 12,000 troops, winning engagements at Argentines and St Maurice in September and October 1793. The conflict soon escalated with Austrian and Neapolitan forces being mobilised for an invasion of southern France to recover Nice and strike into Provence. The Allied forces were bolstered by some 45,000 Austrians, Piedmontese, and Neapolitans, with additional support from the British Royal Navy. Before the Allies could launch this assault the French, under tactical command of André Masséna, launched the Saorgio Offensive (April, 1794), which was planned by the army's artillery commander, General Napoleon Bonaparte. This two-pronged French offensive drove back the Allied force, despite their strong positions, and firmly captured the mountain passes that led into Piedmont. A new offensive, again devised by General Bonaparte, was similarly successful[specify] despite its more complicated nature, calling for the co-ordination of the Army of Italy and the Army of the Alps. Further French assaults on the Allied positions were called off under orders from war minister Carnot, who was concerned about supply lines being cut by rebels behind the front. The commanders in the field were unhappy about this decision, but appeals were interrupted by the overthrow of the Committee of Public Safety and its leader, Maximilien de Robespierre (28 July 1794). During the political chaos that ensued in the French army, the Allies launched an assault on Savona. Ignoring Carnot's orders, the commander[who?] of the Army of Italy launched a counter-offensive and secured supply routes to Genoa following victory at the First Battle of Dego. Following this the French consolidated the front and awaited further opportunities. The main focus of the war then shifted north to the Rhine, until 29 June 1795, when the Austrians launched an attack against the depleted and poorly supplied French Army of Italy. Nominally 107,000-strong, the Army of Italy could only manage to field an effective force of about 30,000. Kellermann, who had resumed command, appealed to Carnot for reinforcements. Instead, General Bonaparte was appointed to the general staff where he devised a third plan for an attack towards Vado and Ceva. Kellermann was replaced by General Schérer soon after and he carried out the attacks, gaining victory at Loano. Following a short respite in hostilities Schérer resigned[why?] and Bonaparte was appointed commander-in-chief on 2 March 1796. The motives for Bonaparte's appointment were most likely political. On 9 March, Bonaparte had married Joséphine de Beauharnais, who had shared her imprisonment (under Robespierre) with the woman who had become wife to Tallien, one of the then Directors of the French Republic. It was "universally believed" that Josephine had been introduced by her friend to the First Director, Barras, and had become his lover. [note 1] Josephine's letters claim Barras had promised the command to Bonaparte, before she'd consented to marry him. Barras is cited by his colleagues as saying of Bonaparte, "Advance this man or he will advance himself without you." Bonaparte had shown himself to be highly ambitious and had made a name for himself following 13 Vendémiaire in 1795. 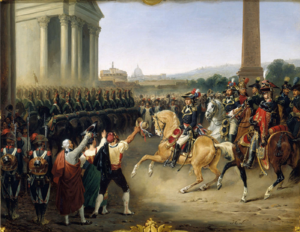 By placing him in command of the Army of Italy, Bonaparte was being assigned to an obscure front: of the Republic's thirteen principal field armies, the Italian force was the most neglected and was in terrible condition when Bonaparte arrived. Bonaparte launched attacks almost immediately after he arrived on the front on 27 March. His 37,000 men and 60 guns were facing more than 50,000 Allied troops in the theatre. His only chance of support came from Kellermann's Army of the Alps, which was faced by a further 20,000 Allied troops. Bonaparte had no chance of gaining reinforcements as the Republican war effort was being concentrated on the massive offensives planned on the Rhine. At the Battle of Montenotte Bonaparte defeated the Austrians and fought a second engagement around Dego soon after. Following these battles he launched an all-out invasion of Piedmont and won a further victory at Mondovì. Piedmont was forced to accept the Armistice of Cherasco on 28 April, knocking it out of the war and the First Coalition. It had taken Bonaparte just a month to defeat Piedmont (between his arrival and the armistice), a country which had resisted the French armies for over three years. Total losses during the lightning campaign were 6,000 French troops and over 25,000 Allied. The Army of Italy was now reinforced to almost 50,000 men and Bonaparte continued on the offensive, striking at Austrian forces mobilising in the vicinity of the fortress of Mantua. A series of minor Coalition defeats resulted in the garrison at Mantua being reinforced to 12,000. Placing Mantua under siege, Bonaparte then led a French division south to invade and occupy Grand Duchy of Tuscany and the Papal States, defeating Papal forces at Fort Urban. Next he turned north and with 20,000 men defeated some 50,000 Austrians under Field Marshal Wurmser at the battles of Lonato and Castiglione. The Austrian commander was forced back into the Alps. Wurmser was reinforced once again to compensate for some 20,000 losses sustained in the past two months and made an attempt to relieve the siege of Mantua. Some 45,000 Austrian troops were left behind to guard against any new French offensive whilst the main body of the Austrian army moved on Mantua. At Rovereto on 4 September, Bonaparte inflicted a heavy defeat on the Austrians and was then well-placed to strike at the rear of Wurmser's army. Reacting slowly to this new threat, the Austrians were again defeated at the Battle of Bassano, where their army was reduced to just 12,000. The remaining troops marched rapidly towards Mantua, but became trapped there by General Masséna's advance party. Additional Austrian forces arrived whilst Bonaparte's army was weakened by disease and his supply lines threatened by rebellion. Government political commissars, especially Cristoforo Saliceti, brutally put down the uprisings, but the French position was weakened. To stabilise the situation Bonaparte created the client states of Transpadane Republic and the Cispadane Republic. Following this a new Austrian commander, Joseph Alvinczy, arrived and made another attempt to relieve Mantua. Bonaparte drove back Alvinczy[where? ], but his counter-offensive was seriously hampered by Vaubois’ defeat over five days in the villages of Cembra and Calliano. Alvinczy held off a French attack at Caldiero on 12 November and Bonaparte was forced to withdraw. In the following three-day Battle of Arcole, Bonaparte won an important and surprising[to whom?] victory against Alvinczy. Both sides were reinforced before Alvinczy launched another attack in January. Bonaparte defeated this renewed assault at the Battle of Rivoli, inflicting some 14,000 casualties. Then he surrounded and captured a second Austrian relief column near Mantua. Soon after, Mantua finally surrendered to the French, making it possible for the French to continue their advance eastwards towards Austria. After a brief campaign during which the Austrian army was commanded by the Emperor's brother, the Archduke Charles, the French advanced to within 100 miles of Vienna, and the Austrians sued for peace. Bonaparte's campaign was important in bringing an end to the War of the First Coalition. ^ Lockhart phrases this elliptically, "It was commonly said—indeed it was universally believed—that Josephine, whose character was in some respects indifferent, possessed more than legitimate influence over the First Director." ^ a b John Gibson Lockhart, Napoleon Buonaparte, new edition, (London: Bickers & Son, 1927). This page was last edited on 10 October 2018, at 00:10 (UTC).